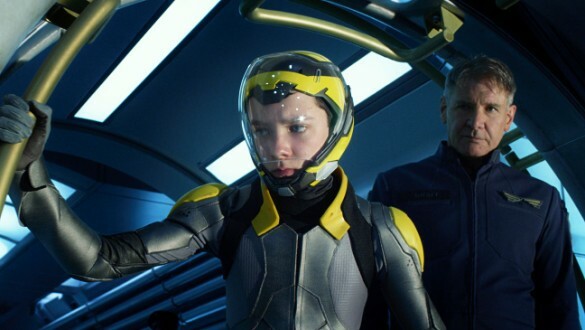 Ender’s Game, the sci-fi adventure film based on the Orson Scott Card novel of the same name, only opened this past weekend (and earned a tidy, if slightly underwhelming, $27 million over the weekend), but it’s never too soon to start talking about sequels in Hollywood – and we’ve got the first insight to what could be the next installment in the series. If you’re a sci-fi fan, you probably realize that Card wrote a sequel novel to Ender’s Game called Speaker for the Dead. In a perfect world, the sequel conundrum wouldn’t be an issue at all because Lionsgate and Summit would simply move ahead adapting that novel for the screen. However, this isn’t a perfect world, and Scott’s follow-up novel isn’t exactly the same kind of book as Ender’s Game. For starters, it takes place decades after the first novel, meaning there would have to be some extensive revision to get the current cast into it in their present form. Second, it’s more of a hard sci-fi book than a straight space adventure, making selling the tone a real challenge. To help solve this problem, Card has revealed that he’s hard at work on a new book in a YA series of novels entitled Fleet School, and that this will be a more direct sequel to Ender’s Game. Here’s Card talking about the plot of the new book. “It’s about what happens to Battle School after the International Fleet loses its purpose of war. A 'fleet school' will form and prepare kids to be 'commanders [and] explorers in the colonies that are going to be forming.'" Problem solved, right? Well, not exactly. While Fleet School will work perfectly as a sequel, there’s that whole bad PR thing following Orson Scott Card around. The author’s pointedly antigay comments inspired some to organize a boycott of Ender’s Game, even though the author signed a deal wherein he can’t profit from the film. Sequels would be a different story – meaning the boycotters would be out in force. So, basically, it’s too soon to start lining up for tickets for an Ender’s Game sequel, but if one should happen, would you be interested in seeing it?